The city of Albuquerque is looking for development teams to redevelop the historic De Anza Hotel. A full copy of the RFP can be found by clicking here and a copy of the market study we did for the City can be found here. Of the many consulting assignments I’ve had the pleasure to work on, this was one that I probably learned the most. Our stakeholder sessions included some of the original employees who worked at the hotel in its hey day and remember the pink cadillac the owner used to pickup VIPS as well as the numerous political announcements made there. Something very unique to the hotel is the priceless artwork embedded in the main common area space. 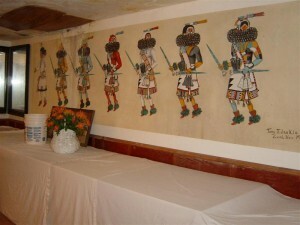 The original developer, CG Wallace, hired native american’s to depict an medicine ceremony with life size Shalako dancers. To the best of historian’s knowledge, this artwork is the only piece like this that can be found off of a reservation.